Fish monthly tournaments from April through October. We fish bodies of water all over, but are most frequently fishing in Illinois and Southern Wisconsin. We have six scheduled tournaments plus a club Classic. We ask our members to fish at least four of our regular season tournaments, which allows everyone to fish and still have time for other obligations. If you enjoy the competitive nature of tournament fishing, our top anglers participate in the annual 6 Man State Championship, which can put you on the road to fish the Bassmaster Classic. Check out our Schedule for a listing of all our upcoming tournaments. Participate in impromptu buddy tournaments. 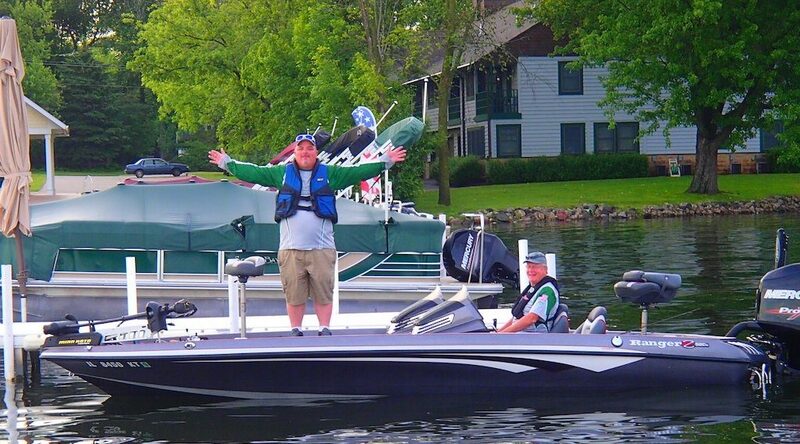 Members frequently call buddy tournaments just to get out on the water and have some fun. Anyone can call a tournament and name the location. Access our members only message board. The message board is the life of our club and is a place for keeping in touch with fellow members while sharing information, swapping gear and having a few laughs. Meet new fishing buddies. One of the biggest perks of being in our club is the opportunity to meet new fishing partners. Whether you drive the boat or fish off the back of it, it’s always fun to get on the water with some friends. Our members attend a monthly meeting at Tilted Kilt in Schaumburg. Meetings are generally held the first Tuesday of every month at 7 p.m. Drop on by to meet the guys and learn a bit more about our club. Fill out the membership application to be contacted by one of our Board Members for more information on Greater Chicago Bassmasters. Filling out the application is not a commitment to join. Enter the number you'd like us to call you at to discuss our club. Standby boater has a boat but wishes to fish as a non-boater.